According to a recent ongoing survey conducted by Volvo, "nine out of ten New Yorkers and 86% of residents in California feel that autonomous cars could make life easier." Comparatively, 62% of Pennsylvanians feel more autonomous cars on the road will eliminate traffic accidents. And only a small majority of Texans — 60% — believe autonomous cars could keep their family safer. Illinois residents are even more skeptical. 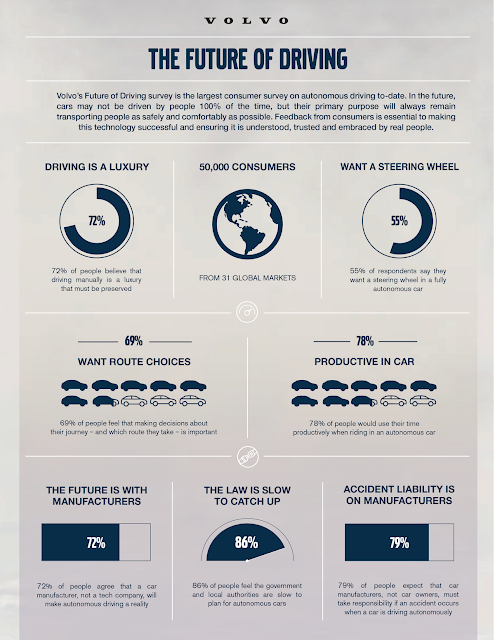 Only 52% of Illinoisan would trust a self-driving car to make safe driving decisions. Volvo is in the midst of hosting the Future of Driving Survey, which it calls the largest "conversation about autonomous driving to date." In fact, nearly 50,000 people have responded to Volvo's questions about self-driving cars so far. While its data shows Americans differ in their eagerness for and trust of autonomous cars, 90% of them agree that government agencies and local authorities are slow to respond to or plan for self-driving cars. This most recent dissection of the growing data from respondents should leave us with a few takeaways. First off, carmakers and autonomy advocates like me need to do a better job of educating the public of the benefits of self-driving cars. Lastly, and perhaps most importantly, government officials need to do an even better job of getting out in front of the tech and supporting it as it comes down the road. I'm looking at you, Secretary of Transportation Anthony Foxx.